Without a doubt, one of the best ways to gain full-body fitness is to swim. Many gardens are a good enough size to install a pool to suit your family’s needs. Plus, they’re pretty good for adding value to your property! There are plenty of different pools to choose from. If you know that you’re going to be playing in there with the kids, then consider a shallower, shaped option. This makes it easy for you to play with inflatables or get the net across for pool volleyball. For the serious swimmer, you can invest in an infinity pool. These give the illusion that there is no edge or end of your pool. Not only does it look amazing, but some offer a treadmill effect so you can continuously move toward the edge, getting a great workout. Even if you just love swimming lengths, there are plenty of ways to adapt your exercise routines with a swimming pool. And who doesn’t love the chance to sit by the pool and dip their feet in on a hot summer day? Many people mistakenly believe that home gyms are expensive and a big drain on power. Have you ever considered an outdoor gym in your garden? Plenty of play parks and public green spaces have outdoor gym equipment installed for your free use. This same equipment can be installed in your garden for your private use. Pull up bars and balance beams are just some of the static items you can use. For more of a dynamic workout, consider equipment that moves. Again, this doesn’t need to be plugged into the mains. It will work by your motion and movement and is therefore safe to use in the garden all year round. If you’re planning to put in a good hour, it might be worth building an arbor or pergola. This can bring some shade and shelter to the area where you position your equipment. A good landscaper can design your garden and complete all the heavy work for you. Of course, you might have plenty of ideas about the look and style of your garden yourself. You might want a couple of trees for shade, and some hedges or shrubs to bring some structure to the garden. Then, of course, is the planting of flowers during the spring and summer. When you’re looking for a reliable landscaper, it’s worth considering how much work you need to be done for your garden. Companies like Surrounds Landscaping are full-service, so you can see the extent of landscape services you might need for your own garden. 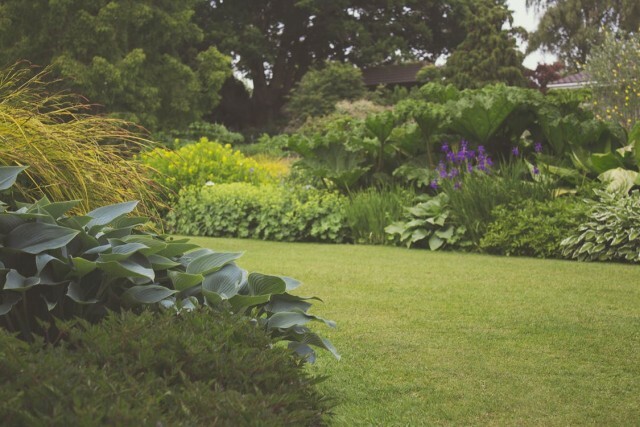 Maintaining your garden so it looks good all year round is a big job that you might not want to have to manage on your own. Part of your healthy lifestyle might include a healthy diet. Growing your own fruit and vegetables provides fresh produce when you want it without the hassle of grocery shopping. Best of all, it really can’t get any fresher than sourcing it from your own backyard. You can grow organic, so you know what you’re eating is the healthiest food you can get. Chemical free, fresh, and hassle-free produce? What could be more healthy than that? A Zen garden can be as simple and as minimalist as you like. Many people add water features, rockeries and planting to beautify this area. You don’t even have to use sand or gravel. Why not install a decked area adjacent to the garden so you can enjoy the view. Add a light covering, and you have created the ideal space for Yoga, Tai Chi or quiet meditation. The sound of the water flowing from your pond or fountain can help enhance deep relaxation. While many people are happy to build a sauna inside their homes, not all of us have the space. A simple timber cabin or structure can be ideal for this purpose. Sauna is a very healthy approach to relaxation. The sauna can help your skin to detox and even support a healthy immune system. Best of all, it helps your aching muscles to relax when you’ve had a particularly hard day at work. Electric power is not essential, but it’s best to consult your chosen sauna supplier for advice. Hot tubs are a great way to wind down after a hard day in the office. The warmth of the water and all those bubbles can massage the tension away in minutes. Installing a hot tub in your garden isn’t tricky. All you need is a secluded corner. This can, of course, be built from a simple pergola or canopy cover. Over time you can use climbers and creepers to create your own little hideaway for the evening. Once you’ve grown all that healthy produce, you might continue the healthy theme by taking your meal out into the garden. Outdoor dining is thought to aid digestion and enhance your relaxation. The extra fresh air will certainly be good for all the family. Some even say it tastes better when you’re in a beautiful garden environment too! Wherever you live, the garden can be your haven. You might be positioned in a city or deep in the countryside. With the right landscaper and good gardening skills, you can create any view you like. Best of all, you can use your garden space to enhance the healthy lifestyle you dream of. Relax, eat well, and work out for good health in your own home.